A high-end LeTV smartphone has been spotted on the AnTuTu benchmark. Dubbed LeTV Max Pro, the device in question carries a model number of X910. 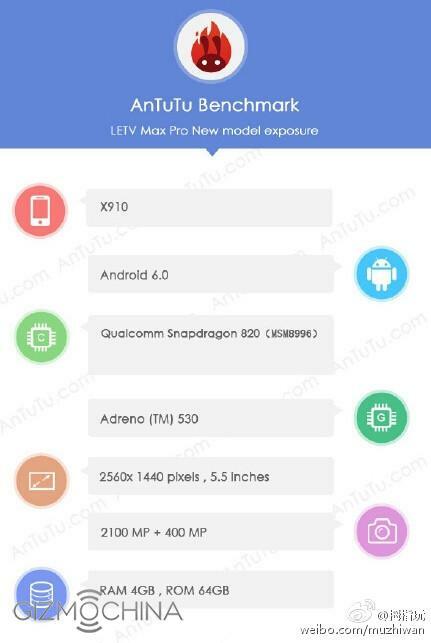 As you can see in the screenshot above, the benchmark listing also reveals some of the key specs of the device. It is powered by Qualcomm's upcoming Snapdragon 820 chipset, and sports a 5.5-inch (2560x1440 pixel resolution) display. The Max Pro comes with 4GB RAM and 64GB internal memory. In terms of camera, the listing shows that it features a 21MP rear unit and a 4MP front shooter. The device runs Android 6.0 Marshmallow out-of-the-box.